Holiday Bliss~ Time is running out!! 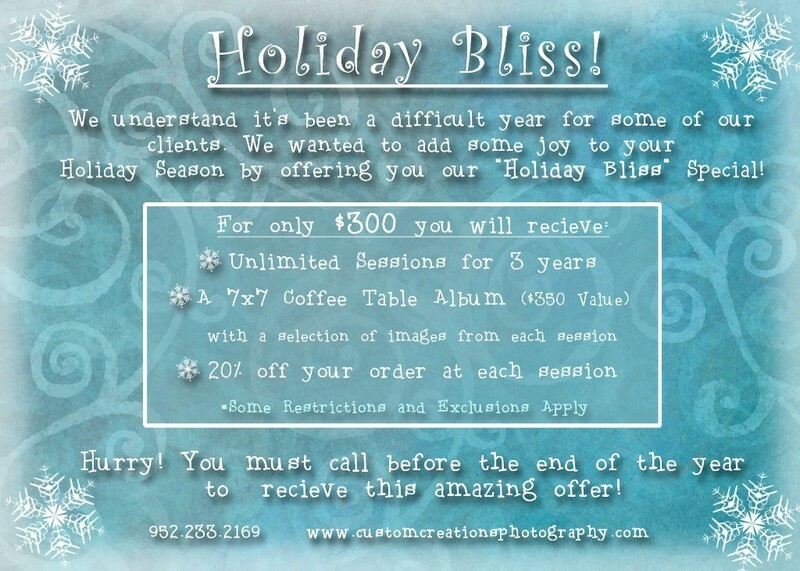 Holiday Bliss~ Time is running out!!! Time is running out for this offer! You must call by the end of the year (Dec. 31st). We’ll even throw in a bonus gift of $125 value if you call before 5p.m. on Wednesday!! We wanted to offer a clients an opportunity to save some money over the next three years (the gift that keeps on giving!!!). We truly believe that photographs are an important part of our lives, as they serve as the memories we will cherish for a lifetime! We don’t want you to feel you can’t have beautiful, professional photos because you are feeling the effects of the economy! Posted in Uncategorized | Comments Off on Holiday Bliss~ Time is running out! !